In the United States, a total knee replacement operation is among the most commonly performed types of elective surgery, with hundreds of thousands of procedures being done each year. There is also a trend for younger patients to undergo total knee replacement procedures. In the past, it was mostly an operation done on elderly individuals who have suffered through years of painful osteoarthritis. These days, with more Americans wanting to lead an active lifestyle, patients who are decades younger are speaking with their doctors about having a total knee replacement. This is especially true of those who have engaged in long distance running, which is often hard on joints and can lead to arthritis. The arthritis can cause bone spurs in the knees and that will often cause severe pain and stiffness in the knee, leading to the possible need for a total knee replacement surgery. One interesting aspect of younger people having a total knee replacement surgery is that medical researchers are able to learn more about the long term effects of the surgery. According to a recent news feature from Science Daily, one international study conducted in Sweden, among other places, shows patients who had a total knee replacement 10 or more years ago will be at a statistically significant higher risk for having a hip fracture. There are various types of hip fractures, according to the article. With one type of hip fracture, known as a non-vertebral fracture, hip replacement patients developed an increased risk of four percent compared to the rest of the general population. However, with respect to what is known as a vertebral fracture, the risk increased to nearly 20 percent, which is clearly more significant. One thing to keep in mind is that artificial knee joints, when constructed properly, ,will typically last between 10 and 20 years depending on the lifestyle of the patient and the type of artificial knee used. However, in many cases with older patients, the durable medical devise will work as long as needed for the remainder of the patient’s life. However, as our Boston knee replacement injury attorneys can explain, if the artificial knee implant was defectively designed, as we have seen with the Stryker knee, for example, it may fail in much shorter amount of time, such as one to three years after implantation. 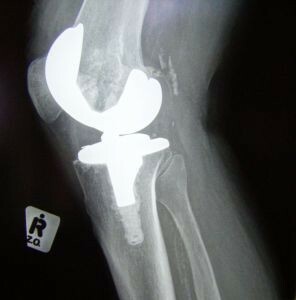 There are many ways in which a defective artificial knee can fail. In some cases, we have seen parts of the device become shaved off, causing damage to the surrounding tissue and making the joint not function smoothly. If the shards are made of metal, as they sometimes are, they can cause a serious infection in the patient’s blood known as metalosis. This can also happen with certain defective hip replacement devices, such as the Pinnacle ASR made by a company called DePuy. Another way in which the artificial knee can fail is if it was defectively designed so that it will become loose and rock back and forth. This can lead to a great deal of pain and suffering and will require a second surgery to repair the damage.